Location & Map - St Austell - Cornwall Where is the Eden Project and how close is it to our self catering holiday cottages at Classy Cottages We are lucky. Both the Eden Project and our cottages are conveniently located, near Fowey, in South-East Cornwall. Our holiday cottages are on the most beautiful unspoiled stretch of the Cornish Coast. 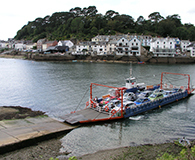 The short and picturesque ride down the coast to the Eden Project fits in with the whole ambiance and experience of the project itself – beautiful Cornish lanes - crossing the picturesque Fowey Estuary on the ancient ferry route. A romantic start to a day that you will not forget. A befitting highlight to a super holiday within easy striking distance of the Eden Project site (just eight miles away).